The thought of speaking with your parents about their finances and estate planning probably makes you want to run as fast as you can in the opposite direction. Nonetheless, having this conversation is the key to helping make sure your parents are able to live their golden years without financial worries and that their wishes are carried out after their death. A team effort: If your parents have legal and financial professionals that help with their matters, make sure to get a full list of these individuals’ contact information. You should also have the contact information of your parents’ doctors, in the event end-of-life decisions need to be made for them. Last will and testament and a trust: If your parents do not have a will written up, they likely do not have any other estate planning documents. If they do have wills in place make sure to confirm how long ago they were drafted, who the executor will be, and where the original documents are located. A trust may also be appropriate depending on your parent’s circumstances and wishes. Stress to them that you do not need to read the terms, but that you should know where they are so you can help ensure their wishes are carried out. Advanced directives: Make sure your parents have living wills and powers of attorney so that someone will be able to make decisions on their behalf if they are unable to do so. Also ensure you understand their respective feelings about end-of-life decisions, such as life support, and how their financial and medical affairs should be handled should they become incapacitated. Insurance policies: Find out what insurance policies your parents have and where the policies are located in the event one or both become incapacitated. This includes knowing about health insurance (private or Medicare), life insurance, homeowners, auto insurance, disability insurance, and long-term care policies. Financial and investment accounts: Your parents should also consider compiling a list of their brokerage, bank, and mutual fund accounts as well as the account numbers. This will make things easier if someone needs to step in and assist with financial matters due to their death or incapacity. Failing to put together an estate plan often leads to chaos, unnecessary costs and taxes, potential hurt feelings, delays in distribution of assets, and even unexpected outcomes after death. For example, if your parents hold some assets in joint tenancy with a child who lives nearby but does not include other children, the distribution of the asset becomes distorted. 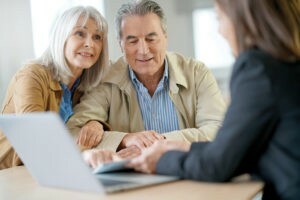 When joint tenancy is used instead of an estate planning tool like a trust, adult children left behind will be offended as a result of the parents’ asset distribution.